Seems to be a general history of the art. I consider myself well versed in it, but am always interested in generalities. This is mainly due to each of these general studies offering up a good bibliography of ancient sources which I can then follow up on for specifics. I'll post a more detailed review when done. Some of these books look to be general studies and then end up surprising you with an unknown gem or two. A brief, occasionally amusing history of the ideas and personalities behind alchemical art/science from ancient Greece to early modern Europe. As a history of science it's so-so: I'd describe it as more of a compendium of diverting stories and anecdotes rather than an engaging analysis of the (pseudo)scientific ideas that made up alchemy. Typically, the author quotes lengthy and obscure passages from various alchemical treatises, but doesn't make the effort to analyze or explicate them within a useful context for someone new to the subject. These I found to be more annoying than edifying, and Holmyard's ostensible lack of enthusiasm for the topics (either that or intellectual laziness) didn't exactly encourage me to explore more on my own.By far the most interesting parts were Holmyard's condensed biographies of the several alchemical cheats/quacks/swindlers who made their way through the courts and town squares of pre-modern Europe by duping the gullible -- sometimes absconding with a chunk of change, and sometimes ignominiously meeting their Maker with a rope around their neck. There are undoubtedly more up-to-date and better written accounts out there which attempt to examine alchemy in the context of the history of ideas. But hell, I bought this for a buck and it was a quick read, so nothing to complain about! This book, published in 1957, is the oldest book I've ever read (The Picture of Dorian Gray is older,  but my copy was published in 2001 so Alchemy is still the physically oldest book I've read). After doing a project on the periodic table and the elements, I decided I wanted to learn a bit about alchemy - and being a huge Harry Potter fan, some information about the history of and myths surrounding the philosopher's stone sounded cool too. I'm the kind of person who learns better out of books rather than on the internet, so asked my local library for some books on alchemy. This was one of the ones they gave me.On the whole, I was very disappointed in this book. The language was really difficult to understand and the only interesting or memorable fact I can remember being taught was that in one version of the Greek myth of Jason and the Golden Fleece, the Golden Fleece was a paper describing how to turn base metals into gold and the secrets of eternal life, in other words, it was an alchemical paper. That was a cool fact, but not really worth the time I spent reading this book. I gave up after 150 pages, but the writing is so small that it felt like a whole lot longer. I would not recommend this book to anyone wanting to learn about alchemy, now can I please get the hours spent attempting to read this book back? E.J. 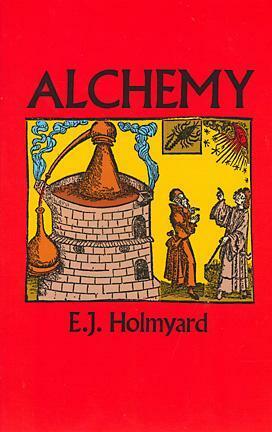 Holmyard - Eric John Holmyard was a historian of science and technology with a focus on chemistry and alchemy. He taught science at Clifton College (England), was a member of the Royal Asiatic Society and served as the founding editor of the journal Endeavour.